DHCP provides a dynamic way of handing out an IP configuration to clients. � I’ll use the following topology. SW1 is purely a L2 switch with no routing capabilities for this topology. Let’s start by configuring a DHCP pool on R2. By default the DHCP server service is running. It can be disabled via the no service dhcp command. Cisco IOS allocates addresses from the range in an ascending order starting at the first available address (.1 in this case). � Note I excluded R2s .254 address from the range before defining the DHCP pool on R2. 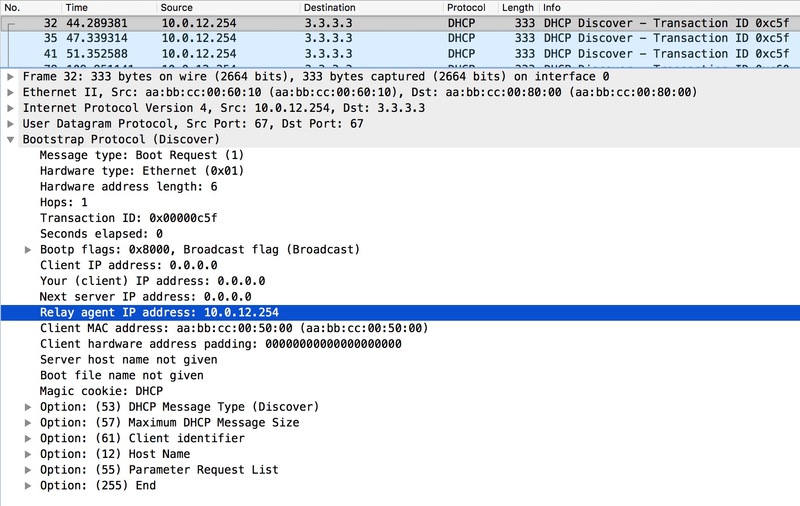 This is the DHCP Discover packet. It is a broadcast and the client has set the broadcast flag, meaning that the client wants to receive a reply via broadcast. 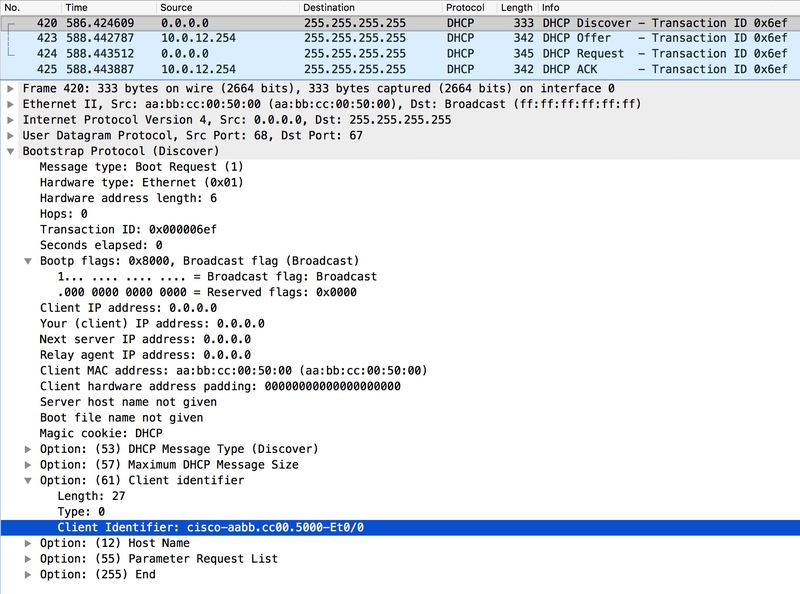 In IOS you can control the broadcast flag under an interface using the ip dhcp client broadcast-flag [set|clear]. Per-RFC the client source IP address must always be set to 0.0.0.0 prior to obtaining an IP address. Let’s have a look at the Offer the server sends. The client requests the IP address using Option 50. It also lists the DHCP Server Identifier, because multiple DHCP servers could be present on the subnet. Finally the server Acknowledges the request from the client, letting it know that it has created a binding for the client. This wraps up the DHCP messages sent between the client and server. Later I’ll cover the DHCP Relay function. You might want to lock down a binding to a specific client. I could be a printer og some other device you do not want have the IP address change. This is done using the client-id in a DHCP host pool. Here we also see our client-id – both as a string, and in a hex dump as we saw in the capture. To create a reservation for R1, we have to create a host pool on R2. A host pool is based on a host address and a client-identifier to locate the pool and hence the address specified in the pool. 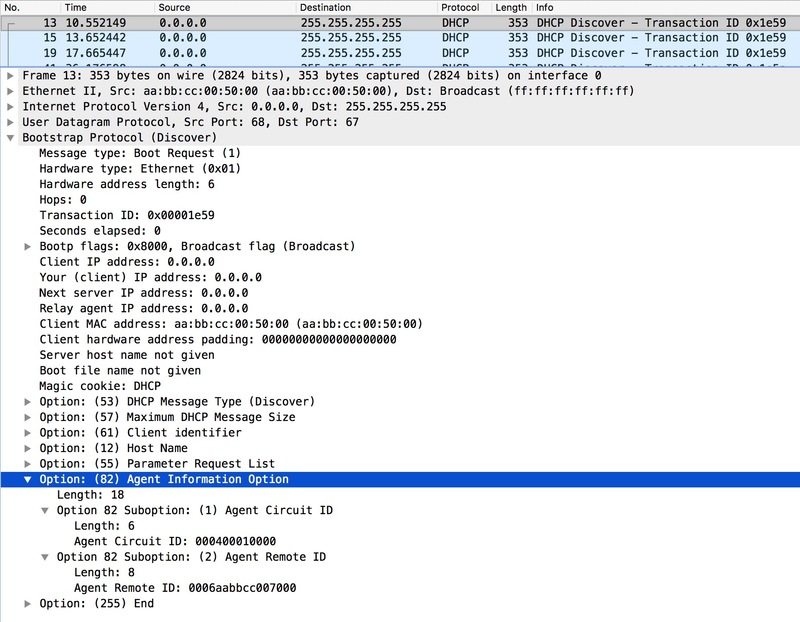 DHCP server packet detail debugging is on. *Nov 9 20:59:56.927: DHCPD: DHCPDISCOVER received from client 0052.31 on interface Ethernet0/0. Usually the DHCP server resides in some Data Center and not on the same subnet as the clients. This provides a challenge as the DHCP messages are broadcast. You can configure a router to relay the DHCP messages to the DHCP server via unicast. If we extend the topology a bit and make R2 a regular router and add R3 as the DHCP server, we can have a look at the relay function and what it does to the messages. I’ve also moved the � a DHCP pool from R2 to R3. Notice the L3 header of this packet. It has the source IP of R2s Eth0/0 interface facing R1. Also R2 has set the giaddr (Relay agent IP address). This address is used on the DHCP server to find the correct DHCP pool and to tell the DHCP server where to send the DHCP Offer. Especially the last part about the destination address of the Offer is important as it requires that R3 has a route back to 10.0.12.254 in this case. If it does not have route back, the client will never receive the Offer. As soon as we have routing in place R1 will receive the Offer from R3 via R2. DHCP Snooping works by assigning roles to switchports. By default all ports are treated as untrusted, meaning we cannot have a DHCP server attached to them. This means that the port we do have a DHCP server located on (usually the uplink ports) must be configured as trusted port. Let’s try to configure SW1 with DHCP Snooping. First we define the VLANs for which we want to enable DHCP Snooping. Next we enable the feature. Lastly we configure the uplink port (connecting to R2) to be trusted. *Nov 10 22:29:59.057: DHCPD: inconsistent relay information. *Nov 10 22:29:59.057: DHCPD: relay information option exists, but giaddr is zero. Se see that it complains about inconsistent relay information. And the relay information option exists, but giaddr is zero. What does this all mean? When a switch is configured for DHCP Snooping, by default, it enables insertion of Option 82.
packet SHALL discard the packet and increment an error count." *Nov 10 22:56:20.054: DHCPD: client's VPN is . *Nov 10 22:56:20.054: DHCPD: setting giaddr to 10.0.12.254. Now the DHCP message is from trusted interface and R2 sets the giaddr to the receiving interface IP. Usually DHCP snooping is a feature enabled on our access switches in the campus network to protect against rogue DHCP servers. An unusual place to enable this feature is in the Data Center where the DHCP server is located. The reason for this is that we typically have full control over all devices in our Data Center and every device has a static IP configuration. But if we rely on DHCP in the DC too, we can leverage DHCP snooping. Now the DHCP server is located on R1 which is connected to the SW1 in our DC. R2 is the relay and R3 is the DHCP client. First we instantly see that we need to configure the port on SW1 facing R1 as a trusted port. R3 receives the IP 10.0.23.3. So not only is it necessary to define the port facing the DHCP server as trusted, it is also crucial do define the port facing the relay as a trusted port – both when traffic is sent upstream towards the DHCP server and downstream towards the DHCP client. Only applicable when DHCP Snooping MAC address validation is turned on. 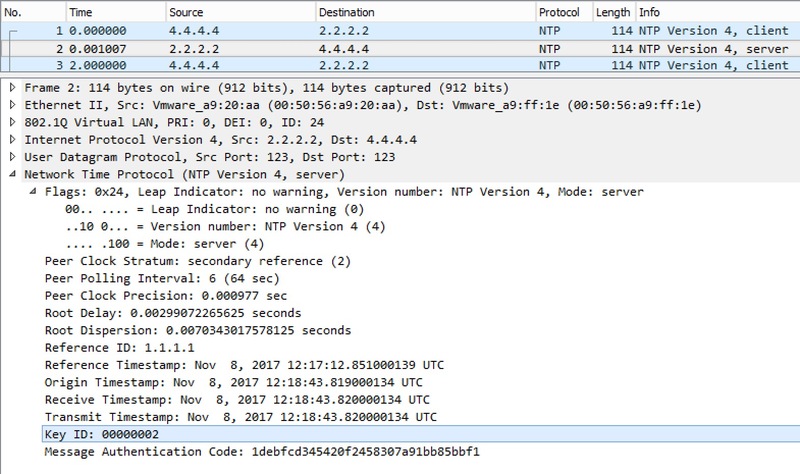 A DHCPRELEASE or DHCPDECLINE is received on an interface that does not match the interface of the DHCP Snooping Binding table. 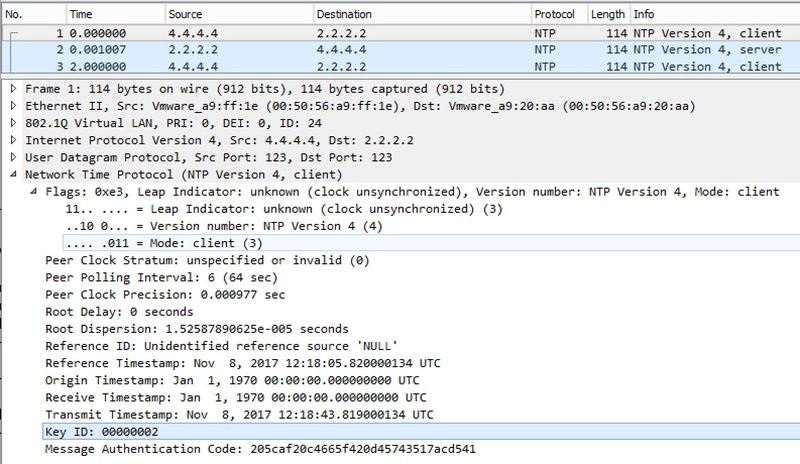 We have all the necessary information to be able to forward the packet to the relay agent (being a regular unicast packet), but the switch tries to lookup the client mac and fails. It does state that it will try to do a lookup using the packet mac destination address, but R3 never receives the Offer. Neither does R2, the relay agent. Making the switchport facing the relay agent trusted is really the only option here. NTP (Network Time Protocol) is a way of distributing time to devices over a network. It uses UDP/123 for transport. Stratum is referring to how many hops you are away from an authoritative time source. The lower, the better. Stratum 1 is the “Root” that has its time from an atomic or GPS clock. Stratum ranges from 1 to 15. The default value is 8. By default any router is a NTP server. No configuration is required! In the above topology we’ll set R1 to be the NTP Stratum 1 server. First we configure the clock locally on all routers. This ensures fast adjustment once we begin polling time from R1. Why must we then configure something on R1, if the NTP server requires no configuration? Well, since R1 does not have a valid source of time, we must tell it to be able to distribute time even though it is not synchronized to an existing time server. We make it an authoritative server using the ntp master command. Clock is synchronized, stratum 1, reference is .LOCL. system poll interval is 16, last update was 12 sec ago. R1 now has its clock synchronized and is configured as a stratum 1 server. The reference clock I .LOCL. (local). Here we see that R1 is associated to itself (127.127.1.1) which is the .LOCL. clock at stratum 0 (the reference clock). In essence we’ve made R1 available as an authoritative� NTP server for client devices. A client is configured by specifying the server from which you’d like time. NTP message sent to 1.1.1.1, from interface 'Loopback0' (2.2.2.2). 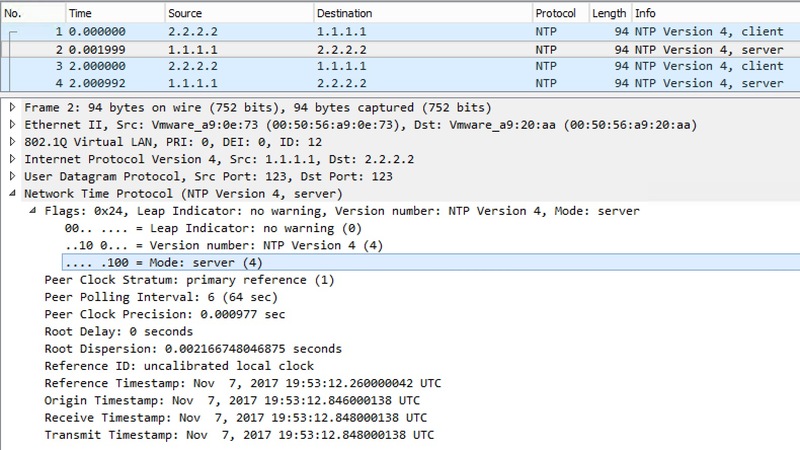 NTP message received from 1.1.1.1 on interface 'Loopback0' (2.2.2.2). NTP Core(DEBUG): ntp_receive: peer is 0x7F347D4D8658, next action is 1. NTP Core(DEBUG): Peer becomes reachable, poll set to 6. NTP Core(NOTICE): Clock is synchronized. Off the bat we see that R2 runs NTP version 4. This is good as NTP version 4 is the newest version that also supports IPv6. It does not synchronize as fast as NTP version 3, though. We also see that R2 is currently unsynchronized and runs as a client. R1 replies saying it is the server. We also see the stratum (1). The Reference ID is the reference clock of R1. system poll interval is 128, last update was 311 sec ago. 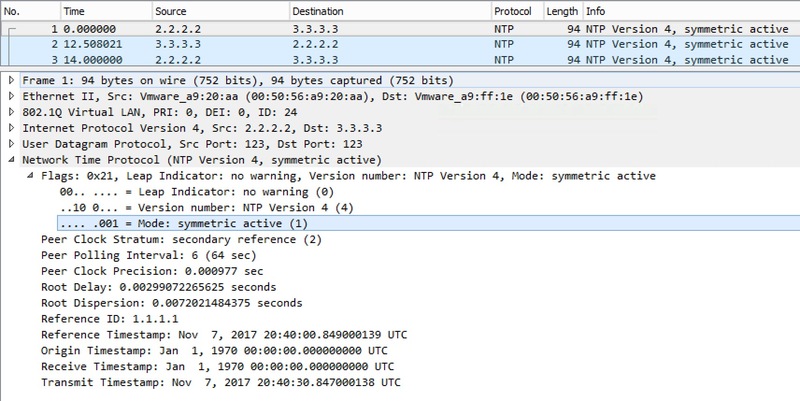 NTP has a peer function that makes a router synchronize to/from other peer routers. As long as the peers have the same stratum, they’ll synchronize each other. This provides redundancy. I think about it a bit in the same way as I think about iBGP peers. If a router looses its time from its primary source, it will still be able to serve correct time to clients, because it peers with another router who has a valid source. This mode is also called Symmetric Active. Here we see the symmetric active mode. Both R2 and R3 actively polls each other. With NTP you have several options for controlling who can access your NTP implementation and how. Control messages are used instead of SNMP to obtain NTP information. I’ll not go into further details here. Please see RFC 1305 for more information. Of the four� options, only the top three are of interest. And out of the three only the peer option makes it possible for the local system to be updated with time information from other sources. If we build on the example with R2 and R3 peering with each other, we can use an ACL to ensure that only R2 and R3 can peer – even if someone accidentally misconfigures or adds a peer. NTP Core(NOTICE): ntp_receive: dropping message: restricted..
Ups! Remember the function of the peer ACL option? To list devices that we can synchronize with. Devices that can update our time. R1 is our stratum 1 server and we just made it impossible for it to keep providing time to R2 and R3! Now R2 and R3 can be synchronized by each other, and R1. Note! If you configure a NTP ACL for one of the options (say peer) and you use other option (say serve), you must also configure a NTP ACL for the serve option! If one option is configured, all the other options are denied. Even though you can specify a NTP source interface globally, this will not be used in this mode. The source will always be that of the configured interface. Here we’ve specified the subnet broadcast destination for the link between R4 and R5. But because directed broadcasts are disabled by default on interfaces, we must enable it on the Gi1.45 link on R4 to make R4 forward it out that link. That’s it for NTP broadcast. A more efficient way of doing this in a larger scale is to use NTP multicast. 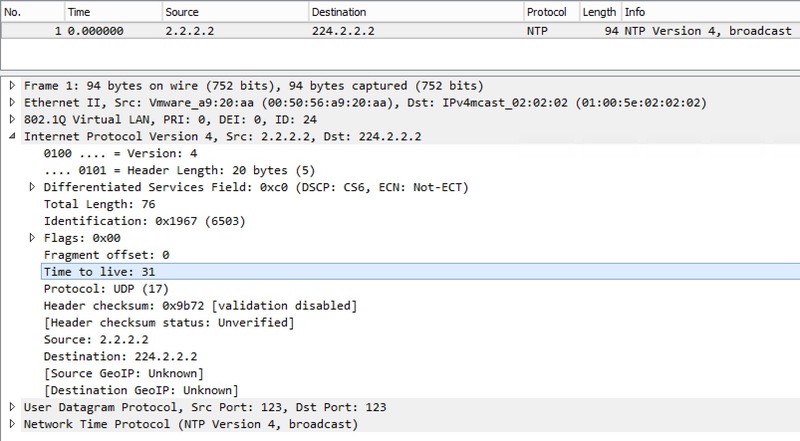 Like NTP broadcast� you can configure NTP multicast. It is configured roughly the same way as NTP broadcast, but with a few more options. Nov 7 21:48:14.847: NTP message sent to 224.0.1.1, from interface 'GigabitEthernet1.24' (10.0.24.2). 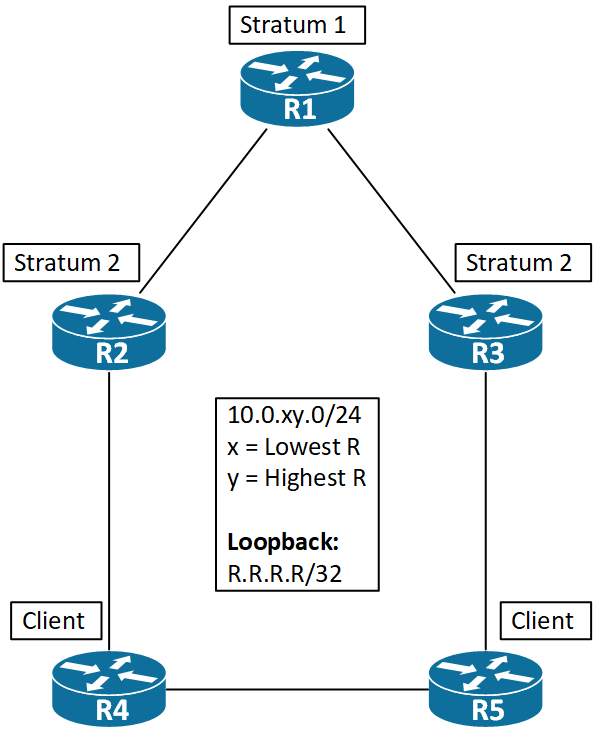 This does require you to configure multicast routing in your network. Let’s assume that we’re running PIM sparse mode (because nobody sane would run dense mode). We must have a RP (Rendezvous Point) when running ASM (Any Source Multicast), because the source is not known to the receivers. I’ve configured R2 and R3 as RPs and configured PIM sparse mode on all interfaces. Nov 8 09:27:33.847: NTP message sent to 224.2.2.2, from interface 'Loopback0' (2.2.2.2). NTP message received from 2.2.2.2 on interface 'GigabitEthernet1.24' (224.2.2.2). NTP Core(DEBUG): ntp_receive: peer is 0x00000000, next action is 6. NTP message sent to 2.2.2.2, from interface 'GigabitEthernet1.24' (10.0.24.4). NTP message received from 2.2.2.2 on interface 'GigabitEthernet1.24' (10.0.24.4). NTP Core(DEBUG): ntp_receive: peer is 0x7FCA5B2BA680, next action is 1. R4#omes reachable, poll set to 6.
system poll interval is 64, last update was 32 sec ago. Notice the mode is broadcast! Other than that everything is the same as we’ve seen before. 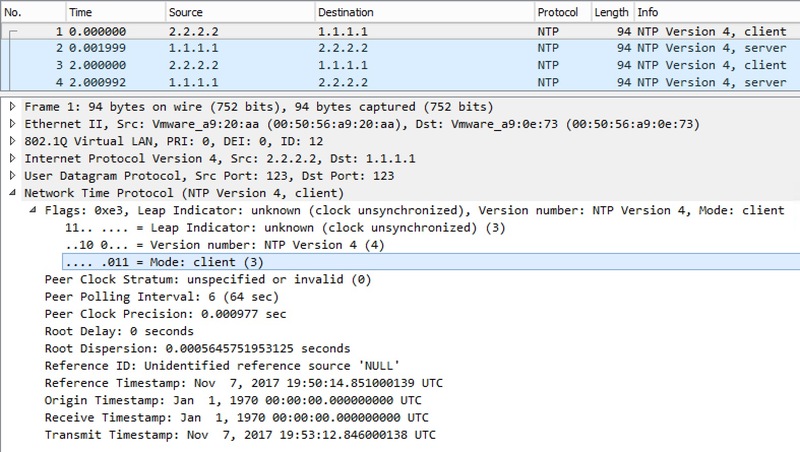 With NTP multicast you have the option to limit the scope of the multicast packets by using TTL when sending out the packets. This is controlled by the server. What about SSM (Source Specific Multicast)? Well, since we can’t specify a source when configuring the NTP multicast client feature, we must statically join the group on the interface on the client. First we specify the SSM range using the default range which is 232.0.0.0/8. It ensures co-existence with ASM by telling the router not to send (*,G) Joins for the ssm range. And since IGMPv2, which is the default version on interfaces, does not allow specifying a source, we must use IGMPv3. With NTP authentication you authenticate the source of time, meaning the server packets. This implies that the server sends out packets with a key ID and a hash that the clients then can validate. So we specify the authentication key ID 2 using MD5 and a string of Cisco. Next we must trust key ID 2 and attach the key ID to the ntp server. NTP message sent to 2.2.2.2, from interface 'Loopback0' (4.4.4.4). 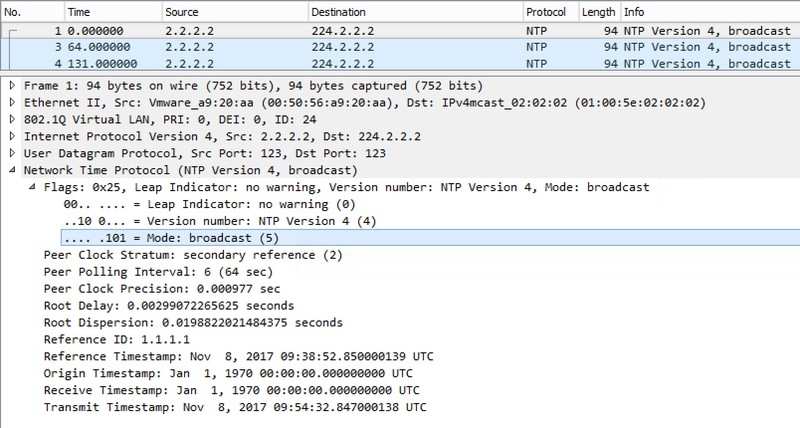 NTP message received from 2.2.2.2 on interface 'Loopback0' (4.4.4.4). This is because we haven’t configured R2 to send the key requested by R4. Like on the client we must specify the authentication key and also make this key trusted to be used. Here we see that 2.2.2.2 is authenticated. To understand how NAT works it is imperative that we establish a foundation by defining the terms used when doing NAT. 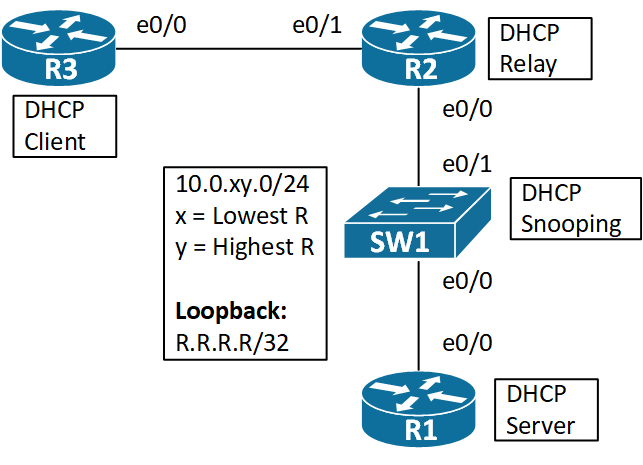 Cisco has a great document that shows the� NAT Order of Operation. It does not explain why you route first before NAT (inside to outside) or why you NAT before routing (outside to inside). The reason why the router must do a route lookup before it can do NAT is that it needs to know whether to do NAT at all. It does a route lookup and finds the exit interface for which you have a NAT statement. Now the router knows it must do NAT if the source qualifies. The return traffic coming from outside to inside must first be NATted to be able to route to the Inside Local addresses. Below is a topology explaining how the IP header addresses change when a packet is sent from a client (R1) on our local network to a server (WEB) � on the global network. The use case could be a cloud app where you have a local dns entry, but you get routed to the cloud app. Here we see that inside our organization we only use Local definitions (Inside Local and Outside Local). These are addresses routable within our organization.� Outside our organization – on the Internet – all addresses are public. Here we use the Global definitions (Inside Global and Outside Global). From the perspective of the inside network, the outside addresses are the destinations we want to reach (DNAT). In contrast, the inside addresses are the sources we use (SNAT). First of all notice that we’re only concerned with the� sources in this configuration. I’ve highlighted the Inside sources in Green and the Outside sources in Red in the above topology. When configuring static NAT you think of the sources of the IP header from the perspective of the inside or outside network. For example, as the reply comes in from the outside, the source is the Outside Global (34.34.34.100) address. This will be translated into the Outside Local address (172.31.255.100). In other words, the translated address is always the last address you type in – regardless of whether we’re doing inside or outside NAT. First we see the inside local source (192.168.1.10) being translated into the outside local source (12.12.12.1).� Then the outside local destination (172.31.255.100) is being translated into the outside global destination (34.34.34.100). For the return traffic we reverse the translations. Other uses cases for this kind of NAT would be a VPN where the remote end has overlapping IP addresses. And another one might be a migration of a server to a new IP address, but not all clients have been configured to use the new IP address and you want to ensure connectivity to both the new and old IP address of the server. When the inside global or the outside local addresses belong to directly connected subnets, the router automatically creates an IP alias which makes it able to respond to ARP requests for these addresses. R1 will be the NAT router and R2 is just something we test against. The above creates an inside source static NAT translation of the inside local address 1.1.1.1 to the inside global address 12.12.12.100 which is connected via e0/0 on R1. As expected we see an alias for 10.0.12.100 and it is listed as a Dynamic address type. So let’s see how this comes to play when we issue a ping from R1s Lo0 to R2. We’ll enable some debugs of both NAT and ARP on R1. First we see that our source 1.1.1.1 get translated to 10.0.12.100 as configured. Then we see that we receive an ARP request from 10.0.12.2 (R2) asking for the MAC address of 10.0.12.100. We reply and the the second packet of the ping is successful. Local proxy ARP works by making the router respond to ARP requests for IP addresses on a connected subnet that is not configured on the router. Like 10.0.12.100 in this case. Despite having no alias on R1, we’re still able to ARP for 10.0.12.100 and obtain connectivity. R2 is the NAT router and it has its e0/1 in VRF RED. "Associates the NAT translation rule with a particular VPN routing and forwarding (VRF) instance." This means that the vrf keyword relates to the source interface. Let’s configure NAT PAT on R2 to make R1 able to reach R3’s Lo0. Remember the order of operation from inside to outside is first we route, then we NAT. The from outside to inside we do NAT first, then we route. So we need routing to be in place when dealing with VRFs. Specifically R1 needs to reach 3.3.3.3 in global. So I defined a default route pointing out e0/1 with next-hop 10.0.23.3 (R3). For the return traffic the router translates 10.0.23.2 back to 10.0.12.1 and� then� it routes. Therefore we must have a route in vrf RED back to 10.0.12.0/24 with the next-hop in global. I’ve trimmed the output, but not touched the order of operation which is key in this output. Same situation as above, but now the VRF is defined on e0/0 of R2 and e0/1 is in global. Notice the vrf BLUE of the ip nat inside source command! This is what can be a bit confusing, because it relates to the inside interface and� NOT� e0/1 as one could imagine. Also the routing is fixed still using a default route for the forward traffic – this time in a VRF with the next-hop in global. And the reverse traffic is routed in global to the VRF by specifying the interface e0/0 and the next-hop of R1.